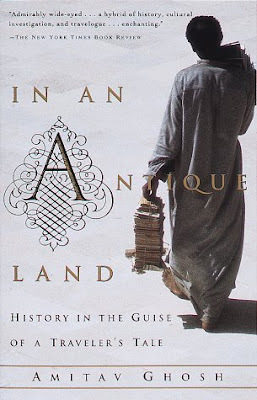 What emerges most strongly from Ghosh's account is the fluidity of medieval Indian Ocean society; how merchants crossed political boundaries with ease and how this movement generated a level of cosmopolitanism and cultural familiarity, a shared understanding across nation, religion, and ethnicity, which we see through Ghosh's account, has broken down. (if it existed at all for the common people). One of the most affecting sections of the book involves Ghosh's encounter with a healer named Imam Ibrahim who refuses to part with his knowledge for Ghosh's anthropological interest. Goading Ghosh about 'those savages' who burn their dead and worship cows, he provokes an angry outburst from Ghosh, who brags that his country "has had a nuclear explosion." Writes Ghosh, "At that moment, despite the vast gap that lay between us, we understood each other perfectly. We were both travelling, he and I: we were travelling in the West. The only difference was that I had actually been there, in person: I could have told him a great deal about it...but it wouldn't have mattered. We would have known, both of us, that all that was mere fluff: in the end, for millions of people on the landmasses around us, the West meant only this--science and tanks and guns and bombs." Altogether this is a most unusual book, and an interesting diversion from more straight-ahead scholarly treatments.